Learn effective tools and techniques to separate big data into manageable and logical components for efficient data visualization. 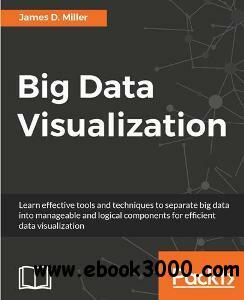 This book works around big data visualizations and the challenges around visualizing big data and address characteristic challenges of visualizing like speed in accessing, understanding/adding context to, improving the quality of the data, displaying results, outliers, and so on. We focus on the most popular libraries to execute the tasks of big data visualization and explore "big data oriented" tools such as Hadoop and Tableau. We will show you how data changes with different variables and for different use cases with step-through topics such as: importing data to something like Hadoop, basic analytics. The choice of visualizations depends on the most suited techniques for big data, and we will show you the various options for big data visualizations based upon industry-proven techniques. You will then learn how to integrate popular visualization tools with graphing databases to see how huge amounts of certain data. Finally, you will find out how to display the integration of visual big data with BI using Cognos BI.